Take a journey through Bethlehem at Ballardsville Baptist Church at their drive-thru Living Nativity. Each year, in December, the church hosts one night where the community is invited to experience the Christmas story in the comfort of their vehicles. As you turn off Highway 53 and arrive at the church, you are greeted by Roman soldiers guiding traffic. Look for the signs with instructions on which radio station to tune into to hear the Christmas story narrated over your vehicle's speakers. On the right side of the parking lot, see if you can see the three wise men with their (real) camels making their way to Bethlehem. You will also see shepherds in their field with their sheep. Listen to the choir singing and take in the sights and sounds of the marketplace. Look for the Inn and the "No Vacancy" sign toward the end of the marketplace. On the outside of town, you will find Mary, Joseph and baby Jesus in the manger. Outside is their donkey and above the manger is the bright star of Bethlehem guiding the three wise men. Keep driving to the church's carport for a treat for everyone in your car. In the past, hot chocolate and cookies were passed out. Ballardsville Baptist Church does a wonderful job with this free community event. Although the drive is only about five minutes from start to finish, you will get lost in the scenes around you. The animals and actors depicting the Christmas story will make you feel like you're in Bethlehem. 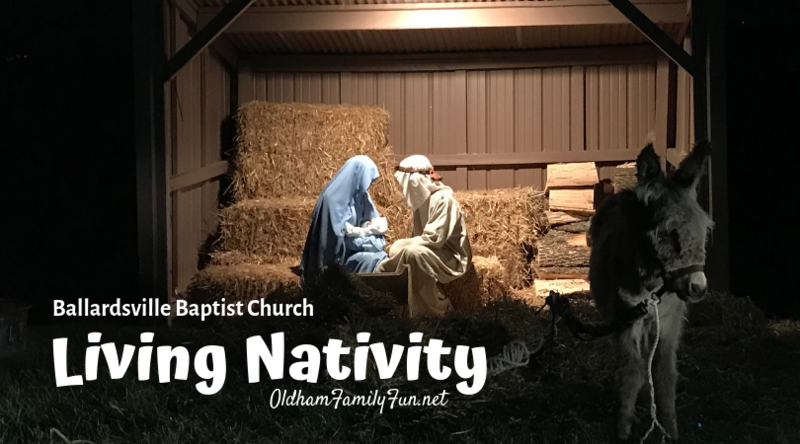 The Living Nativity is a lovely and unique tradition for many Oldham County and surrounding area residents.